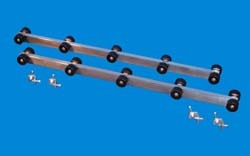 Boat Trailer Accessories | Boat Roller Bunks | Carpeted Bunks | VE-VE Inc. NOTE: These Roller / Carpeted Bunks are QUALITY AMERICAN MADE Products, and you DO get what you pay for! 1 pair T-904; 4 foot long "Roller Bunks" provide a way to convert bunk style trailers to rollers or use for boat roller ramps on shore. NOTE: Shown with optional "Mounting Kit" ( T-904-16 ). T-905;1 Pair 5 ft. "Roller Bunks"
1 Pair T-905; 5 foot long "Roller Bunks" provide a way to convert bunk style trailers to rollers or use for boat roller ramps on shore. 1 Pair T-908; 8 foot long "Roller Bunks" provide a way to convert bunk style trailers to rollers or use for boat roller ramps on shore. NOTE: Shown with optional "Mounting Kit" ( T-908-16 ). 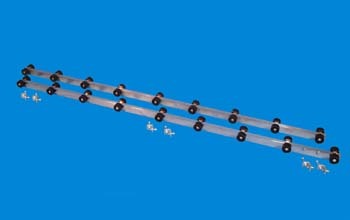 T-904-16 "Mounting Kit". This mounting kit is used on either the T-904; (1 pr.) 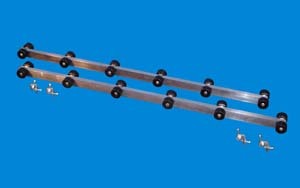 4 ft. Roller Bunks" or T-905; (1 pr.) 5 ft. roller bunks. Kit comes with 4 ea. mount/swival angles & fasteners to attach mount angles to roller bunk tubes & your trailers bunk brackets (Bunk Brackets are Not in kit). T-908-16 "Mounting Kit". This mounting kit is used on the T-908; (1 pr.) 8 ft. Roller Bunks". Kit comes with 6 ea. mount/swival angles & fasteners to attach mount angles to roller bunk tubes & your trailers bunk brackets (Bunk Brackets are Not in kit).